It is important to select the correct needle for machine quilting. There are several types of needles available and most of them have been developed with a specific purpose in mind. Sewing machine needles are numbered eg: 75/11 the lower the number the finer the needle. So a size 70/10 needle is finer than a size 80/12. 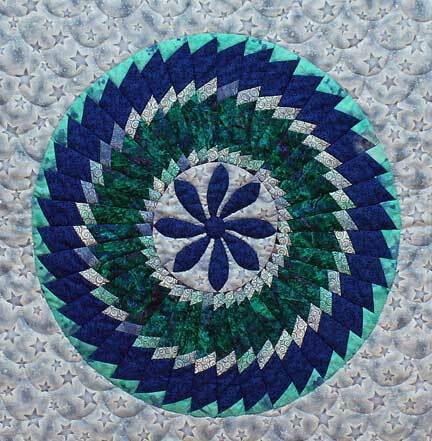 For good results when quilting change your needle every 6 – 10 hours as the wadding tends to blunt the needle. The 2 categories of needles that are most useful when machine quilting are Sharp needles with normal or large eyes. Sharp-Microtex needles, Jeans/Denim and Quilting needles are all sharp needles that are sold in a variety of sizes with a normal eye. All these needles have a sharp point that penetrate multiple layers to make a straight clean stitch. The recommended needle size for machine quilting is 80/12. Finer needles are used such as size 60/8 for quilting with very lightweight threads such as Madeira Tanne 80wt. Size 60/8 needles also used when quilting is very dense. Needles that are larger than 80/12 are not recommended as they make holes in the fabric. Embroidery needles are a sharp needle with a large eye and they are a good choice of needles when using rayon embroidery threads, silk and smooth lightweight metallic threads. Metafil needles have an even larger eye to prevent the stripping and fraying of threads, so common with metallic threads. Topstitch needles have the largest of all needle eyes and are the ideal needle for heavy or textured thread and where other needles may have proved unsuccessful. Your choice of thread is one of the most important decisions you will make when preparing to machine quilt. Always use good quality thread, avoid buying bargain box threads, they are generally made of short fibres which make it weak and abrasive. Threads are numbered so the lightest weight has the highest number. Your choice of thread will depend on your quilt top, select a thread that you enjoy using and that will give you the look you want for your quilt. I prefer to use a 100% cotton for traditional machine quilting as it has the same fibre content of the fabric and blends well with the quilt. Polyester thread is stronger than the cotton fabric in the quilt and may cause the fabric to weaken and wear around the quilting line. Do not dismiss exotic threads such as rayons, metallics, silks and iridescent blends which are fun to use and can give your quilt that special look. It is recommended to use the same weight thread in the bobbin as in the needle. When using different threads in the bobbin and needle try to use similar weights as the tension will naturally balance with similar or equally weighted threads.